Tripp talks to Michael Dowd this week to round out our series on evolution. 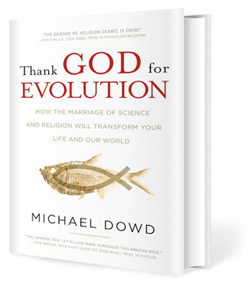 Michael’s book Thank God for Evolution has been endorsed by five Nobel Laureates. He is an ‘evolutionary Christian’ exploring how current science shows evolution is not meaningless blind chance. His work transcends debate to give us a new way to think about science in light of faith. You can download the first 50 pages of the book on the website. San Antonio is well-represented this week with calls from Paul Soupiset and Pete Zimmerman. Great to hear from you two. Next week we’ll be back without the pirate and flu voices.